Since the kids have Spring Break all next week (it actually starts tomorrow) Jessica and I won't be able to do our "usual" lunch after our long run on Monday. The kids will be home, so we'll have to change up our plans for next week. For that reason, we decided to go to Whole Foods after our 8-mile run (our semi-long run of the week) today. We've both been thinking about that turtle brownie that we had last time, and we thought getting the brownie and a cup of coffee sounded perfect after our run. Excuse the fact that I look like a sausage stuffed into a casing. I ordered a size small shirt when I registered for that race, but after I registered, I saw that they said the shirts are running small, so order a size up. When I got my size small shirt, I saw that they weren't kidding--it was very small! Anyway, since we were "only" running 8 miles, I didn't feel the need to really prepare for it--no carb loading like we do the night before a long run, I didn't bring Gu with me, or anything like that. Quick and simple. Or so I thought. This 8-miler was the second-worst run I've had since marathon training started. The worst was the 13-miler. Almost immediately, I felt like I had zero energy. It was hard to put one foot in front of the other. I felt very out-of-breath, which normally I don't feel when I run slowly like that. And then, after about 3 miles, my knee really started to hurt. Not just a normal ache, either--it was really painful, particularly on the few downhill portions we had. I had planned an out-and-back route, but we really fucked that up somehow and wound up back at the car at mile 4... so we just did the same loop again. There were a lot of uphills and a few downhills--normally, we run on very flat surfaces, so maybe the hills irritated my knee? Dunno. But Jessica's knee was hurting too. We kept thinking about the turtle brownie, and it made us push through the pain. When we got back to the car after mile 8, my knee hurt so badly. I stretched for a minute, but I really just wanted to sit down. We got in Jessica's car and headed to Whole Foods. A cup of decaf and the brownie were the only things on my mind at that point! We headed right over to the bakery, oohing and ahhing over the desserts. When I got to the case where they keep the brownies, there were only two left: one walnut brownie and one chocolate chunk brownie. No turtle brownies! :( We both stood there shocked for a minute, and then Jessica asked the boy working there if they had any more. He went in back to check, and we eagerly waited. When he came back, he said he was sorry, but they didn't have any. The other brownies didn't look nearly as good as the turtle brownies were, so I was trying to decide what else would be satisfying. Jessica got a fudge brownie, and right after she took a bite, the guy said that they found some in back! I was so glad, because nothing else would have satisfied me like that stupid turtle brownie. We waited for him to finish helping someone else, and then he went to cut into the new batch of brownies when he realized that they were the walnut ones--not the turtle ones. Can't even describe our disappointment. I ended up getting a peanut butter brownie thing (layer of brownie, then peanut butter, then chocolate ganache) and a decaf Americano coffee. The dessert was good, but not as good as the turtle brownie. I still felt like I was missing out on something when we left. I realize that sounds ridiculous, but I was totally looking forward to that turtle brownie! Have you ever been super disappointed when you were really looking forward to eating something special? Anyway, I'm considering taking tomorrow off of running. I am scheduled for a 4-mile easy run, but if my knee is hurting, I'm going to give myself a 3-day weekend of not running. Next week is a step-back week, meaning our long run is shorter--we "only" have to run 12 on Monday. I do want my knee to be feeling better by then. You don't look like a sausage in that shirt, woman! You look great! I TOTALLY get your disappointment with the brownie scenario. I have been waiting four months to go have a "splurge weekend" (spent four days in Denver with my basketball coach aunt for the Final Four tourney) and she didn't go to ANY of the restaurants I wanted to go to, so I didn't get to splurge the way I wanted. Sure, I had *whatever I wanted*, but I left on Tuesday still feeling like I totally wasted my calories. Next time I have a splurge meal/day/weekend/whatever, I'm TOTALLY doing my own thing. Thirdly, WTF!? I would've been beyond disappointed and bummed if I got there and there wasn't the brownie I wanted! BOO! BOO! BOO! But, a huge congrats for sticking with it and logging in the miles… You had the opportunity to call it short at 4 miles but completed the run. That's awesome and an accomplishment. Hmmmm...I've definitely been disappointed foodwise! If there is something I'm really looking forward to, I've been known to call ahead to make sure my craving can be tamed. Thanks to crazy tracking, I learned my workouts are harder when I am PMSing. I can't believe they didn't have turtle brownies...I would have been like "listen bakery boy, make me some turtles and no one gets hurt!" HAHA! I started laughing so hard when you guys wore the same thing again it's so funny. You guys were meant to be friends it's obvious lol! LOL - I have totally been there wanting something and then being so disappointed. The substitute item is just never good enough when you get your tastebuds hankering for something. I wouldn't have guessed you wanted the turtle brownie.....I think you only said turtle brownie about 20 times. LOL!! Around Thanksgiving, they had this Pumpkin Ice Cream Dessert at Friendly's that I wanted SO bad. My mom and I were supposed to go outlet shopping in another town an hour away and we were going to stop by there on the way and have lunch. We got there and they had closed that Friendly's. I was so upset. Then later we ended up seeing one in the town where we went, and so I was all excited to get some there. They had the sign advertising it, and when I placed my order, they said they were all out. I was so aggravated! I'm sorry your knee hurts. For some reason my hip, like where it meets the top part of your leg, has been hurting for a week. It comes and goes. It's starting to freak me out a bit. I've been running for a year and haven't had an injury, and I am not sure what's up. I am thinking of not running and just doing something easier like walking until it feels better. I think it might be worse when you actually *get* the turtle brownie you were craving and find out that it is wholly disappointing and a waste of well-earned calories. (The turtle brownie probably wouldn't have been disappointing, but I hate it when that happens). P.S. I went to this place called Smart Cookie a couple weeks ago in American Fork, Utah, and they have a black and white cookie that was soooo goood. Thought of you! I just started a new job and I have a bit of a cold, so after a successful first day of work my bf suggested we go out for some nice hot ramen to make me feel better. I loved the idea so we headed to the ramen place and it was closed! My heart sank. Then we remembered another good ramen place nearby and headed over, only to learn they were closed Wednesdays! My heart couldn't handle any more lifting and sinking, haha! I have also had runs where despite the shorter length, I just can't get my feet or attitude to cooperate! That happened to me recently with the food disappointment. There's an Italian restaurant in the town where my in-laws live, not really that far way, but far enough that it's not somewhere we could normally just swing by for lunch on a weekday. I had been once for lunch YEARS ago when my in-laws took me there for my birthday and I had gotten this AMAZING lobster ravioli. It was SOOO good! I thought it must be a special because I had never seen it on their menu before or again. Not too long ago, it was my sister-in-law's birthday and she wanted to have lunch at this place (I switched some things around at work so I could make it). I checked the menu online and it turns out they only have lobster ravioli on their lunch menu. So I was SO looking foward all week to having this wonderful lobster ravioli. Most dishes there come with a salad OR pasta, but since ravioli already is pasta, it came with a salad. As I'm eating my salad, the waitress comes back and tells me they're out of the lobster ravioli. I was so thrown off by this and nothing else really looked that great. My MIL told me they had great eggplant parm, so I ordered that. But I would normally have wanted pasta with it (they have great pasta) and I already had the salad so I couldn't switch. The eggplant parm was totally mediocre. I left there so incredibly unsatisfied! That turtle brownie has to be mighty fine to trump the peanut butter/chocolate combo! 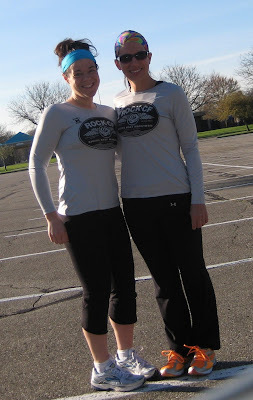 As I came across the photo reading through the blog post today I thought "wow look how slim and fit Katie looks!" Then I read your sausage casing line. I litterally scrolled back to see if we were talking about the same photo. You look amazing girl! Love the matching outfits. I have a friend who that happens with a lot. One time we showed up in the same outfits with our daughters in the same outfits!!! The kids were NOT impressed LOL! I also live in Ontario and there's a Whole Foods in Oakville if you live anywhere close to it. Apparently in the next year or do there's supposed to be more opening in Toronto and Ottawa. That would seriously bum me out! I remember one long run, I kept motivating myself to keep pushing with the promise of chocolate chip pancakes when I got home. Several miles later, I discovered we were out of two of the ingredients. I could have cried. I run so I can eat more, so it was a sad day. You know who your audience is here don't you? Have WE ever been disappointed when a food we wanted was unavailable? Well YEAH, only about a hundred times. I know there's lots of people who are runners only who read your blog, but lots of us are weight losers who are also food addicts and obsess over food and when we want something and then can't get it--it's MAJOR! I feel your pain!! LOVE the matching outfits, and your size SMAll looks great. I just tried on a yellow top I have (it's a large--although sometimes I can wear a medium, and even bought a SMALL top the other day--it ws the only one they had left--and I tried it on, and since it was a kinda full style--it FIT! I won't lie--that was FUN!) and I love the yellow top although I have to wear something over it, since it's sleeveless, and you've seen my upper arms--HIDEOUS. Well I also noticed it kinda shows off my little stomach pudge. It's one of my trouble spots that sometimes clothes don't cover, like my hanging chin waddle which is leftover from my double chin--I hate that too! Anyhow I was thinking when I was looking at your picture in the stuffed sausage t-shirt(that's what you called it--not me--I think it looks great), and you don't have that stomach bulge anymore. I think it looks GREAT. I see the young girls when I'm out at the mall, and they wear those skin t-shirts and look so nice and I think to myself, "Yeah, see how you look after you have babies!" But you've had babies and still look like that--WOOHOO! And just because you had surgery doens't mean you didn't go through a lot of pain to look like that--we all know what you've been through and believe me--you've earned that FLAT belly! Happy Easter Katie--have a great day with that wonderful family of yours, and give that goofy Phoebe a kiss for me! I turn into a psycho if I can't get a certain food that I have been craving & working myself up mentally to get. It will take over my brain until I get it and nothing else will satisfy my craving for it. I have been known to go completely out of my way, drive hours, and cry to get certain foods I am craving! So bad. Sorry to hear about the knee. Rest up and hope that a weekend of rest helps so that you are ready for you "only" 12 mile. Love the terms used when training for a marathon. What a bummer about the dessert. Next time you should call ahead and tell them to have it ready.